Country Mouse Tales: It's Here! Can you feel it? It is officially here! Summer, it all it's sticky, sweaty, BBQ glory is officially here. Although we got a head start two weeks ago with Matt's official last day of the school year, we are still happily greeting the arrival of this season. Dusting off our inflatable pools and our 4th of July flags, breaking out the freeze pops and the sidewalk chalk, slicing into juicy watermelons. Although I relish the new life growing inside of me, I can't help but be aware that this is the last summer that will be just the three of us. It doesn't make me sad, but it does help me to remember to drink in every moment, every push of the swing and every jump in the pool. I know how blessed we are to have this time together, to all get so much time to simply be us. To head off to the park, the library, the market, or the petting zoo at the drop of a hat (after we have packed a diaper bag of course!). 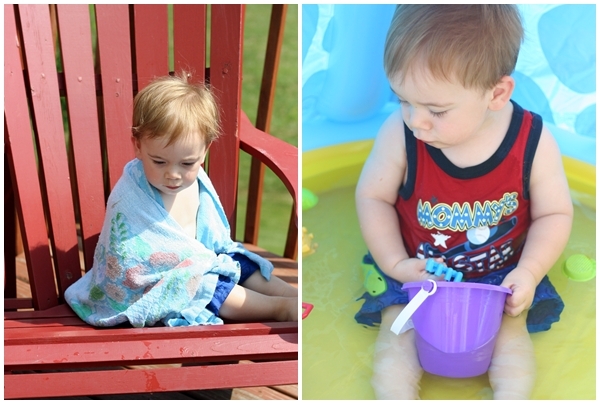 We have our little pool set up on the back deck for the days that are too hot to do anything more than soak one's diaper (or in my case - feet) in some cool water. We have bubbles and chalk, we have laughter...a lot of laughter (and - let's be honest - some tantrums). I try to remember to let go of the little things that don't matter. 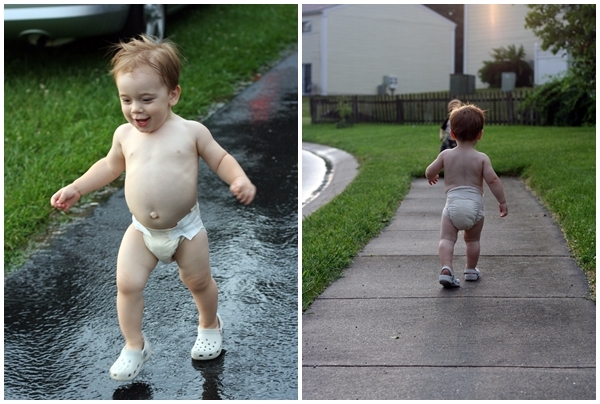 Sure Jack might be up past bedtime, sure he might be outside in nothing but a diaper, but the important thing is that my boy is learning to dance in the rain. To enjoy the precious moments that God gives us each and every day. Some days, we have to really look for those moments, other days they are abundant. This week finds us in the the throes of vacation packing. Two glorious weeks in Florida, one with my family, one with Matt's. We have been making last minute trips to the store for sunscreen and bugspray, juice boxes and fruit snacks. It's chaotic, it's stressful, it's ohmygoshdidwegetJacksmedicineyet? But I am remembering to cherish it. So, to you Summer, WELCOME. I am glad you came, please stay a while. Now...anyone have any toddler travel tips? 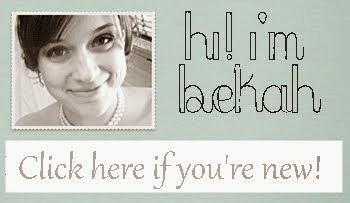 'Cause for the first time, we will be (eek!) flying. If he's not just the picture of summer, I don't know what is! Hey we're about to go to SC for a week of vaca, 10 hour drive! YIKES! Does Jack have a favorite TV show? K LOVES/puffy heart Elmo so for plane trips i have Elmo on the portable DVD player. We have snacks (always entertaining) and books (especially big picture books where she can point to everything) and her favorite blanket and one of those neck pillows for 1. your arm if holding him or 2. their head if they fall asleep on their own. Oh and as bad as this sounds... infant meds right before boarding... makes them a little more tired and subdude. Woohoo! 4 days and counting! awwww such sweet pictures...love the suitcase one the best...its the little things right? 2 words....plane presents. nuf said. Grape cocktails! (AKA Dimetapp, usually mixed with something.) Just don't think of it as drugging your child....you're just helping him out with a nice, long, relaxing nap! Completely harmless too! I swear! Those pictures are awesome! I love the one with the suitcase! Too cute! Oh this makes me jealous of your summer! Ours has been dry, windy and HOT. Every day we're in a constant fire watch.